When you shift to a new home, you need to know where the main shut-off valve is, just in case there happens to be an emergency or some plumbing project to take place. Learn how to sweat copper pipe properly. One very important thing is to know how copper sweating is done. Basic rules like cleaning, fluxing and correctly heating the joints, while constantly rotating the pipe being soldering. Have a know-how of your Plumbing in Scottsdale, AZ. Take ample time to study your home’s plumbing system. Understanding the complete system will assist you to know where to start from suppose there is failure like a major leak or drain clog. Each and every plumber needs to have the correct tools for work. To be on the better side, go in for a complete plumbing kit so as to be ready in case of any plumbing project available. For instance, a plumber should never miss equipment like pipe wrench, propane torch, groove and tongue pliers, metal file, basic wretch, plunger, tubing cutter, hand auger among others. Consistent inspection of pipe lines. 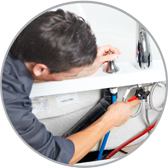 It is very vital that you have a constant check-up of all systems of plumbing so that you can know when there is a problem either major or minor leaks. A plumber who carries out regular inspection, can easily know if there is a leak from the varying water pressure. Plumbing in Scottsdale, AZ can reach a time when they wear out due to prolonged usage. To prevent regular breakdown of the system, consider doing an update of it by replacing old fixtures. This guarantees a long and smooth life away from sudden emergencies.